DENVER – The National Association of Chain Drug Store (NACDS) today presented the Harold W. Pratt Award – its highest honor commemorating service to pharmacy – to Mike Podgurski, Rite Aid Corporation’s vice president, pharmacy services. The award was presented during the Business Program of the NACDS Total Store Expo. Joining Rite Aid Corporation in 1987, Podgurski has contributed extensively to his company from the diverse positions he has held, including pharmacy operations, pharmacy services, pharmacy development and government affairs. Podgurski’s more than four-decade pharmacy career began at West Virginia University College of Pharmacy. As a practicing pharmacist, in 1972 he joined the former SupeRx Drugs, Inc., and advanced from a registered pharmacist position to district manager. Podgurski was recognized this year at the NACDS RxIMPACT Day on Capitol Hill for his outstanding commitment to grassroots advocacy, as exemplified by his engagement at every NACDS RxIMPACT Day on Capitol Hill over the past decade. NACDS RxIMPACT Day on Capitol Hill is the event that brings pharmacy advocates to Washington, D.C. to meet with members of Congress. In 2015, he was named honorary president by the National Association of Boards of Pharmacy (NABP). He has participated in many industry committee and task forces, including the NABP’s Task Force on Pharmacy Licensure Standards, the American Pharmacists Association’s Work Group on the Future of Pharmacy, and the Food and Drug Administration’s Risk Communication Advisory Committee. Harold W. Pratt – for whom the award is named – dedicated himself to many years of service at Walgreens, becoming the industry’s first director of professional services. Over the course of his 43 years of service to Walgreens, Pratt came to be recognized as the “dean” of pharmacy professional service directors. He worked tirelessly to grow and promote pharmacy operations. 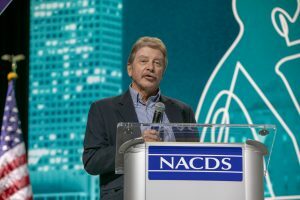 The Pratt Award was established in 1985 by the NACDS Board of Directors and recognizes individuals whose activities have contributed to the promotion, recognition and improvement of the practice of pharmacy in the chain pharmacy setting.